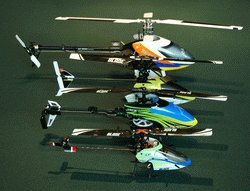 I was so looking forward to the Blade 130X when I first heard that Blade was finally releasing a micro collective pitch heli with a proper shaft driven variable pitch tail rotor over another problematic fixed pitched motor driven tail. Add an efficient & powerful brushless motor to the mix and I really could not wait to get my paws on one. The 130X was discontinued but has just been replaced by the 130 S version. Brushless fixed pitch tail rotor on this version to eliminate the mechanical & vibration issues that plagued the 130x's tail. Here is my review on the 130 S.
After a month or so of flying the Blade130X, it has lived up to most of my expectations and also provided a few nice surprises. It's my favorite heli right now for flying in the yard and practicing basic acro. It has specifically helped me with inverted hovering skills substantially. It's what I was hoping the Blade mCPx would have been in other words and now with over 150 successful flights, it's finally time to get a review out. Before getting into the actual flight characteristics and performance, I'll start with the basics such as design and features. I do also have a separate write-up on the 130X tail vibration or buzz issue that so many people are having - it's a very simple fix if your Blade 130X has it as well. 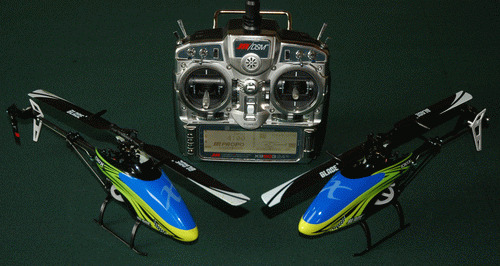 The Blade 130X comes as a BNF (bind & fly) version only so you will need to pair it to a Computerized Spektrum Radio such as the DX6i, DX7s, DX8, etc. It will also bind to JR DSM radios (not the new JR DMSS radios however). Over and above the helicopter, you get a 2S Celectra LiPo charger & AC adaptor, one 2S 300 mAh LiPo flight battery rated at 35C, and Blade's customary parts bag that includes spare ball links, one spare set of rear tail drive umbrella gears, canopy grommets, a set of non weighted main rotor blades and a couple Allen keys and Phillips screw driver. I would personally like to see a BNF basic kit that forgoes the charger and battery to save a few bucks for those of us who have a computerized LiPo charger and LiPo's already, but that's just my thoughts. The instructions are very straight forward and include basic setup suggestions for the various computerized Spektrum radios. Due to the AS3X system, swash setup is a breeze since it does all the eCCPM mix-outs internally. The instructions recommend all travel adjustments to be set to 100% in all directions; however I found with my Blade 130X, both rudder travel and pitch needed to be altered. I have my rudder travel set to 130% in both directions to get the full range of rudder pitch possible. This gives blistering pirouette rates and with the outstanding tail lock this thing has, it's pretty addictive. I have however lowered the pitch travel to 90% in both up and down positions to reduce the min/max collective pitch angle. I found when really banging away on the collective (rainbows for example), at 100% +/- pitch, the rotor really bogged down and a short lived cyclic judder would develop (I'm guessing from excessive blade lag in conjunction with the AS3X system). With a 90% pitch travel value, that issue was solved so if you find you can't manage your collective energy well, you may also want to reduce the pitch range a bit. I did also have to zero the collective pitch angle at 50% on my pitch curve by lowering the swash one full turn on all 3 pushrods, but other than that, it came out of the box in pretty much perfect flying condition. The Blade 130X by the way makes zero degree pitch setting and swash height setting super easy thanks to something I would like to see on all CP birds (at least micro ones). The blade grips and the head have indicator lines that show when the grips are positioned perfectly at zero degrees (I highlighted these indicator lines with a silver marker so they would show up better in the picture here). The next step I would like to see is an actual hash mark grid on the head that would relate to positive and negative blade pitch angles in degrees - something for version 2 perhaps? 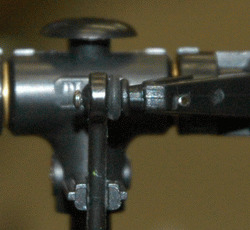 The umbrella gear mounted on the main shaft that drives the tail shaft sits high in the frame resting against the upper bearing and with the help of a collar on the other side of the main bearing, locks the main mast in position (no more load on the main gear causing it to slide down like on the mCPX). Another nice little engineering feature on the Blade 130X is all 3 eCCPM pushrods from the 3 swash servos up to the swashplate have a "U" bend in them to act as a shock absorber. So far, this has helped save the swash balls and perhaps even the servos in some pretty decent impacts I have had. Other than the outstanding tail performance, what I have been most impressed with is how tough this little heli is. I didn't honestly think it would be flyable after hitting the ground at full power considering how fast the main rotors and especially the tail rotor are spinning, but in the many "oops" moments I have had, most of them while inverted no less at full power, the 130X is still in once piece and flying perfectly. The odd swash separation, a broken tail fin, sheered off main blade grip balls (I do have fix for that however further below so it never will happen again), so far are the only minor damages. I'm starting to wonder if it's even possible to break the rotors or canopy on this thing! I do fly over nice soft grass however and I have purposely raised the lawn mower deck height one notch to give a little added thick grass protection. That said, I have had two absolutely all out hard impacts, once into the roof of our house and once into a gravel driveway. I still can't believe no damage was done with both of those impacts. In short, this thing is on par with the mCPx in terms of crash survivability and in some ways even better. A few examples are I have yet to loose a single swash to blade grip ball link on the Blade 130X and as many of you know, those links on the mCPx are always getting torn off or damaged with rotor strikes. No issues with the carbon main rotor shaft or tail boom splitting like on the mCPx either. This Blade 130X "crash proof-ness" is a mixed blessing. On the one hand it can take a beating, but on the other, you may start doing stupid things you shouldn't and crash more often. Eventually something will break not to mention all the wear and tear that over time will cause component failures. It does have a very good power cut feature however when the rotors strike something should you not hit the throttle hold toggle in time to kill the power when an impact is imminent. The 3-in-1 control board is nicely protected and sandwiched between both frame halves. 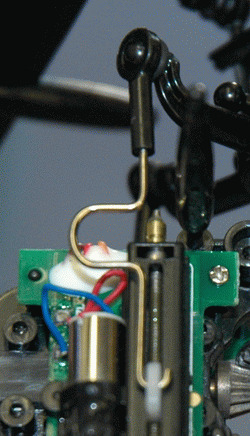 The 4 servo connections are up front, easy to access, and are color coded with the servo plugs. From left to right in the picture; green is the left cyclic servo, black is the forward cyclic servo, pink is the right cyclic servo, and neutral is the tail servo. To add to the fun and customizable experience, even though it's not mentioned in the manual (likely due to the fact that it's setup pretty darn good out of the box), it is possible to adjust cyclic and tail gyro gain on the Blade 130X! That's a pretty cool and higher end feature on a micro heli like this if you want to play around with the gyro response, or end up getting aftermarket blades or other bits that mess with the factory default gain responses. Here is a link to the gain adjustment/programming process; feel free to print it out and add it to your 130X instruction manual. Size wise, the Blade 130X is about twice as big as a Blade mCPx, about the same size as a Blade 120SR, and about 3/4 the size of a Trex 250. Shown here from front to back is the Blade mCPX, the 130X, the 120SR, and my favorite yard practice bird (at least before I got the 130X), my trusty little Trex 250. Since the Blade 130X uses a 2S LiPo, balancing is required. 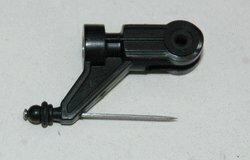 Blade has done something interesting here by using a 3 pin JST-PH plug to act as both the balance and main power plug. This saves a little weight and a little space up in the canopy but it really limits battery options until some other JST-PH aftermarket 2S packs are available and I know they will be since this is going to be such a popular little heli. I unfortunately can't bring myself to pay close to $16 each for a bunch of micro LiPo packs, nor wait for other JST-PH options. Therefore I converted my Blade 130X plug to a regular 2 pin female JST so I can use a variety of 2S LiPo's that come with the customary JST male power plug and JST-XH balance plug. 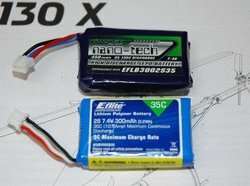 As seen here, I'm using a 2S 300 mAh 35C Turnigy NanoTech LiPo and the Nanos are working very well with my Blade 130X. They also fit very well and are smaller and lighter than the stock Eflite EFLB-3002S35 packs. There is definitely room for higher capacity packs (perhaps up to 400 mAh) . Since I originally wrote this and purchased those 2S 300mAh Nano's, NanoTech now has a 130X specific 2S battery with the single JST-PH plug so it's a direct plug & play option and is still half the price of the stock packs. With a capacity of 450 mAh (150mAh more than the stock pack), a discharge rating of 65C, and is essentially the same size and weight (26g Nano, 25g stock Eflite), it's going to be a popular LiPo for the 130X. I found they give noticeably more punch throughout the entire flight over the stock Eflite packs, don't get as warm, and flight times were up substantially (more on that further down the page). 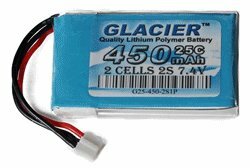 Buddy RC also has their Glacier brand 450 mAh 2S pack for the 130X with the JST-PH plug and it's even less expensive than the NanoTechs. I've been a really big fan of Glacier LiPo's since they came out this past year and found them to perform better than the NanoTech's. One of my main complaints with the Blade 130X, just as with any micro heli is the short flight times. This means you are going to need several packs if you want back to back flights and several packs usually means parallel charging time if you want to charge them all at once to save yourself a lot of time. 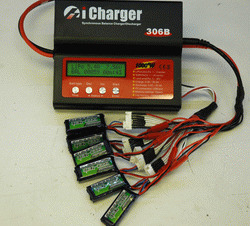 If you use the stock Eflite packs, the 450 mAh Nano's, or the 450 mAh Glacier's that have the JST-PH plug), there are JST-PH para-boards/harnesses available for charging up to six packs at once. Here I have one hooked up to one of my 306B chargers charging 5 of the Nano's and one stock pack - it sure works slick and makes wiring hook up easy, neat, and "goof proof". Since I'm also running regular JST plugs and using the 300 mAh Nano's, I also para-charge with a JST parallel harness and JST-XH parallel balancing harness. Not nearly as neat and tidy as the single plug JST-PH para-board, but it works. I'm charging the 6 Nanos here at a 3C charge rate (5.4 Amps), but they are rated at up to 5C charge rates, so fast charging is certainly very possible). Para-charging six of those 2S 450mAh NanoTech packs at 5C would be pulling 13.5 amps @ 113 Watts, so even micro battery para-charging with these new high charge rate packs could justify a moderately high powered charger if you wanted super fast charge times. First impression - absolutely outstanding! 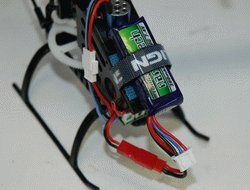 I already mentioned the tail performance and dizzying pirouette rates; but that is likely the first thing that most people will be trying out to see just how good the variable pitch tail performance is, if that little high speed linear tail servo is up to the task, and how well the gyro detects and responds. To sum all that up - the robotic tail lock on this thing is fantastic! It's absolutely impossible to get it to blow out no matter how hard you try and the heading lock is very precise with little to no drift. The next biggest surprise is how BIG this little heli flies. Unlike the mCPx which has next to no mass and can get very squirrelly and requires precise control inputs to make even basic manoeuvres look pretty, the Blade 130X feels and reacts more like a 250, 300, or even 450. Loops can be made nice and round and the little bit of mass and inertia this thing does have, goes a long way to smooth out less than perfect stick input. The AS3X flybarless stabilization system obviously has a lot to do with this. It seems every time a new AS3X version is released, it gets just a little bit better feeling. Like most decent flybarless systems, the AS3X points the heli where you want it and keeps it there like it's on rails. Flips and rolls are very predictable and even in some pretty decent wind, for the size of this little heli, it remains controllable and stable provided you run high head speeds with the weighted blades. One thing however that the AS3X system doesn't have, at least it doesn't perform like it has, is there is no piro compensation; meaning pirouettes will drift out in all directions just like on the mCPx. A great way to hone your nose in transitions right side up or inverted, but holding pin point on the dime piros remains elusive for the Blade 130X. Out of the box, the Blade 130X has the weighted blades installed (the ones with the little bullets on them) and just like the mCPx, I found the weighted blades performed best for all types of flying from tame to aggressive. Having that extra mass in the rotor disc goes a long way to smooth AS3X responses and reactions. For faster flight as I already mentioned, the weighted blades are a must. The non weighted blades when flying fast will setup some pretty severe cyclic oscillations. Speaking of speed, if you like flying fast, both forward and backward, the Blade 130X will not disappoint. I can't get over how fast it is and that can be an issue since it gets small very quickly when flying at speed; but the bright green canopy has a fairly good visual thumb print up there (it does tend to blend into green backgrounds however). As I mentioned before, it is my new yard flying favorite and seems perfectly suited to a 150ft x 100ft flying area making it a nice gymnasium flyer as well. As I mentioned already, the draw back to all this micro collective pitch flying fun (other than micro parts that I find a pain to work with) are the flight times. I was hoping with a brushless motor, they might be a little better, but you obviously can't get away from short micro flight times with current battery technology; still, it's an improvement over the the mCPx (stock or with a brushless conversion). General/docile flying will produce a solid 5 minutes, lighter sport flight about 4 minutes, and full power 3D type stuff with a 100% flat line throttle curve will drop the time down to around 3 minutes (keeping in mind a 80% max discharge on the LiPo's). You can certainly extend all these times by almost a minute if flying right down to LVC (low voltage cut off) but your little LiPo/s won't live a very long or happy life. The other main annoyance with the Blade 130X is a very pronounced tail harmonic resonance that phases in as you spool up. It's gone by the time your rotors are up to flying speed (on mine it shows up at about 17% throttle and is gone by 25%) but it's pretty bad and if you keep it resonating for giggles instead of quickly running through it, it's going to damage parts. As I mentioned earlier, I have a separate page on this Blade 130X tail harmonic vibration and ways to reduce or eliminate it, so feel free to click on that link if you find your 130X's tail has an angry "buzz". If you recall me mention crash damage, several times with high energy blades strikes the balls broke off the blade grips. For any who know me, I can't stand aluminum upgrades on micro helis because of the added weight, expense, performance compromises, and other component damage that almost always occurs when aluminum parts are thrown into the mix. That said, Blade is not exactly giving the plastic grips away either, and keeping a small stock of them on hand was not too appealing; so I too was pondering an aftermarket aluminum blade grip upgrade as hard as that pill was going to be to swallow. Fortunately before going down that path, I decided to first try "pinning" a new set of blade grip balls before they had the chance to snap off. 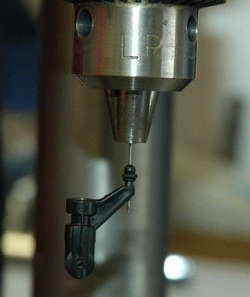 This is fairly easy, provided you have a 1/40" (0.65mm) drill bit and steady hands. I simply drilled a hole through the center of the ball and out the back side of the grip being very careful to get the alignment of the drill bit as close to dead center as possible. To locate and center the drill bit, I first heated up the tip of a pin with a lighter so I could melt a tiny centering dimple dead center on the end of each blade grip ball. This process is not as easy as it looks, and without my drill press, I don't know if I would have been able to do it free hand? Those tiny drill bits are fragile! I then inserted a regular dress makers pin and put a small coating of thin CA glue on it to ensure it would not come out. Lastly I cut the protruding length of the pin off flush to the grip arm with a Dremel cut off disc (being careful not to heat the pin up too much causing it to melt the plastic grip arm) . Since doing this, I have not had one blade grip ball sheer off in many full power blade strikes and I've been able to remain true to stock plastic grips. If this didn't work however; yep, I would most likely be getting a set of aftermarket aluminum blade grips. 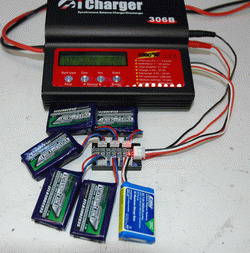 Included In Kit: Eflite 2S 300 mAh 35C LiPo Flight Battery, 2S 7.4V Celectra Balance Charger with AC adaptor. 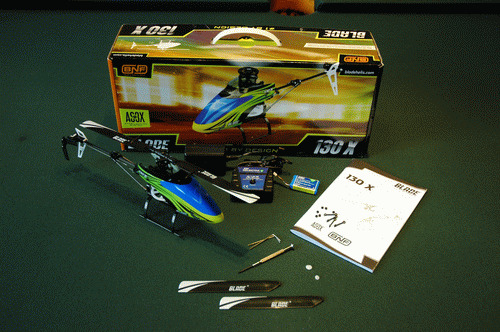 The question I get asked almost daily right now is will the Blade 130X make a good first collective pitch heli. Well, that depends... I still feel a 450 is the better size most people can self learn CP on and a better all round heli, not to mention flight times of 10 minutes or so. So do take those points into consideration. The Blade 130X is certainly a good option however if you have no interest in a 450 or want to learn in your own yard and as I mentioned, crash survivability is very good. It can also be tamed right down just like any CP bird bound to a computerized radio so no problems there. 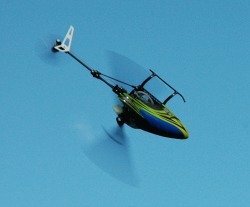 In my opinion (largely based on my personal experience with this heli), I think the person the Blade 130X is perfectly suited for is someone who already knows how to fly CP but wants to start practicing aerobatic skills on something that is small enough so they can do it in their own yard on a crash resistant heli; yet is large enough to see what you are actually doing up there. I have been trying to learn to hover inverted close to the ground for, well - FOREVER! I have been able to hover inverted fine on the sims for years now, but in real life, I always panic, get flustered, and then make mistakes. Flying at speed inverted has never been an issue either, but holding a perfectly still inverted hover over one spot at eye level has remained one of those elusive RC helicopter flying skills I had basically given up on as I'm not getting any younger and the old dog learning new tricks saying had me beat. The Blade 130X has changed this however, and for that alone, this heli for me was practically worth it's weight in gold. Now, I should point out I have been getting marginally better hovering inverted due to time on the mCPx, but it was too small to see the subtle movements while hovering inverted to keep on top of things and stay one step ahead of the heli. It was more a survival inverted hover on the mCPx, flying reactively instead of proactively not to mention the odd tail blow out. I also found just like on the sims, the mCPx inverted time didn't transfer over to the large birds well at all. However, in only about 30 flights on the 130X, I can now enter and exit an inverted hover in any orientation and hold it dead still for the entire battery pack. In all these years of flying RC helicopters, the 130X is the tool that finally helped me with this skill. Just this past weekend, I had my Trex 700E inverted in a stationary hover for most of a battery pack. I'm still a little too scared to bring it right down to ground level inverted, but 10 feet AGL was no issue and was very comfortable. I have actually found all my acro flight on my larger helis has improved a fair amount over the past month due to the time I've been spending in the evenings at home out in the yard flying the Blade 130X. It has made practicing fun again and so convenient because I can do it right at home. In fact, I like this little heli so much, I have done something I never thought I would do with any micro heli - I purchased a second one so I always have a working one on hand should a component fail on one of them. That is how useful of a training tool I have found it to be. Tail repairs are common place, just too small and spinning too fast to be robust enough for variable pitch I guess? The tail really is the weak link on this little heli. Other than those few issues, for me and what I deem important, the good greatly outweighs the bad. I'm really enjoying mine when I don't feel like driving out to the flying field and just want to have some good close-in collective pitch fun out in the yard practicing on a real bird instead of spending time inside on the sim. Like I said, I used to fly the Trex 250 most of the time at home when I wanted to get some CP practice in, but the 130X is very similar in performance, a little smaller, much more crash resistant, and overall better suited for my flying area here at home. The Blade 130X may also be your perfect at home flier as well and is definitely one to consider if you are in the market for this size of bird - just don't forget to let that lawn grow a little taller.